Latin America and the Caribbean (LAC) received an estimated $45 billion in remittances in 2005 (González-Corzo & Larson, 2007). According to the Inter-American Development Bank (BID, 2007), by the end of 2006, remittances to the region were estimated at $62.3 billion and by 2010 they are expected to reach $100 billion. This would represent an increase of 122% over 2005 and 60.5% increase over 2006. If the IDB’s forecast materializes, remittances to the LAC region are expected to grow at an average rate of 24.4% per year during the 2005–2010 period, compared to an expected average annual growth rate of 4% to 5% for the region’s economy during the same period. In some Latin American and Caribbean countries, remittances exceed the foreign exchange receipts generated by merchandise and service exports, foreign direct investment (FDI), international tourism, and official development aid (ODA). As Table 1 shows, remittances play a crucial role in the Cuban and Dominican economies. Cuba and the Dominican Republic share important socioeconomic characteristics. For instance, in demographic terms, Cuba has a population of 11.3 million, compared to 9.3 million in the Dominican Republic; women represent close to 50% of the population in both countries; and persons between the ages of 15 and 65 represent close to two-thirds of Cuba’s and the Dominican Republic’s population (Anuario Estadístico de Cuba, 2006). Both Cuba and the Dominican Republic are highly dependent on the external sector, and remittances and tourism are important sources of hard currency for both countries. Finally, both Cuba and the Dominican Republic have large migrant communities living in the United States and Spain. As a result of the growing importance of remittances, the Dominican Republic has implemented a series of policies to stimulate the influx of these transfers of private capital from abroad. Given the similarities between the two nations, and the likelihood that remittances will continue to play an important role in the Cuban economy during the foreseeable future, the policies implemented by the Dominican Republic to attract and influence remittances offer some valuable lessons for Cuba. Table 2 shows the influx of remittances to the Dominican Republic and select economic indicators during the 1993–2006 period. Thus, the Dominican Republic received $2.7 billion in remittances in 2006 (Banco Central de la República Dominicana [BCRD], 2007). In 2006, remittances represented 42.7% of total exports, 60.9% of exports from “export processing zones” (zonas francas), 72.5% of earnings from tourism, and 232.2% of the value of foreign direct investment (BCRD, 2007). Between 1993 and 2006, the total value of remittances sent to the Dominican Republic grew an average of 11% per year, compared to 5.6% in the case of merchandise exports, 9.3% for tourism, and 41.5% for FDI. In the case of the Dominican Republic, remittances tend to increase during May and December, due the Mother’s Day and Christmas holidays. Remittances to the Dominican Republic also tend to be countercyclical; they generally increase as economic conditions worsen, and decrease after a recovery. However, as Table 2 illustrates, despite their traditionally countercyclical and seasonal nature remittances to the Dominican Republic appear to be more predictable and reliable than other sources of foreign exchange such as earnings from tourism and FDI. The policies implemented by the Dominican Republic to attract remittances since the 1990s are classified as follows: (1) external sector liberalization, (2) financial sector liberalization, and (3) efforts to formalize and modernize the remittances market. In 1984, the Dominican Republic joined the Caribbean Basin Initiative (CBI), which facilitated a greater level of integration between the Dominican economy and the United States by opening the Dominican external sector, and improving its international competitiveness. The approval of the Caribbean Basin Trade Partnership Act (CBTPA) in 2000 accelerated the liberalization of the Dominican external sector by fomenting the expansion of the free trade zones (zonas francas). According to the Central Bank of the Dominican Republic (Banco Central de la República Dominicana), free trade zone (FTZ) exports increased 38.3%, from $2.9 billion in 1995 to $4.7 billion in 2000 (BCRD, 2007a). The liberalization of the Dominican external sector also contributed to increases in foreign direct investment (FDI), and to the expansion of international tourism. Between 1995 and 2000, foreign direct investment in the Dominican Republic grew from $414 million to $953 million, representing an increase of 130.2% during this period (BCRD, 2007b). The accumulated value of FDI since 2003 is approximately $10 billion, and the principal investors are the United States (32.6%), Spain (18.4%), and Canada (15%) (BCRD, 2007b). Despite attracting significant levels of FDI since the 1990s, foreign direct investment in the Dominican Republic has decelerated in the last six years. Between 2000 and 2006, FDI grew only 7.3%, 17.8 times smaller than the 130.2% growth rate recorded during the 1995–2000 period. The liberalization of the Dominican external sector also contributed to the expansion of international tourism. The number of visitors grew from 1.7 million in 1993 to 4.4 million in 2006, representing an increase of 158.8%, or an average annual growth rate of 12.2% (BCRD, 2007c). The number of hotel rooms and the earnings generated by the tourist sector also grew at a remarkable pace during this period. According to Central Bank estimates, the Dominican Republic had 26,801 hotel rooms in 1993 (BCRD, 2007c). By the end of 2006, there were a total of 63,206 hotel rooms, representing an increase of 135.8% with respect to 1993 (BCRD, 2007c). Similarly, by the end of 2006, the earnings generated by the tourist sector reached $3.8 billion, or 210% higher than the earnings reported in 1993 (BCRD, 2007c). The liberalization of the Dominican financial sector during the 1990s also played an important role in attracting remittances from abroad. The approval of Monetary Resolution No. 17 (Resolución Monetaria No. 17) by the Central Bank in 1991 transformed the Dominican remittances market by creating a parallel foreign exchange market, and allowing private, non-depository, institutions to process remittances payments and foreign exchange transactions. The transformation of the Dominican financial sector was accelerated with the approval of the Monetary and Financial Code (MFC) (Código Monetario y Financiero) in 1992. 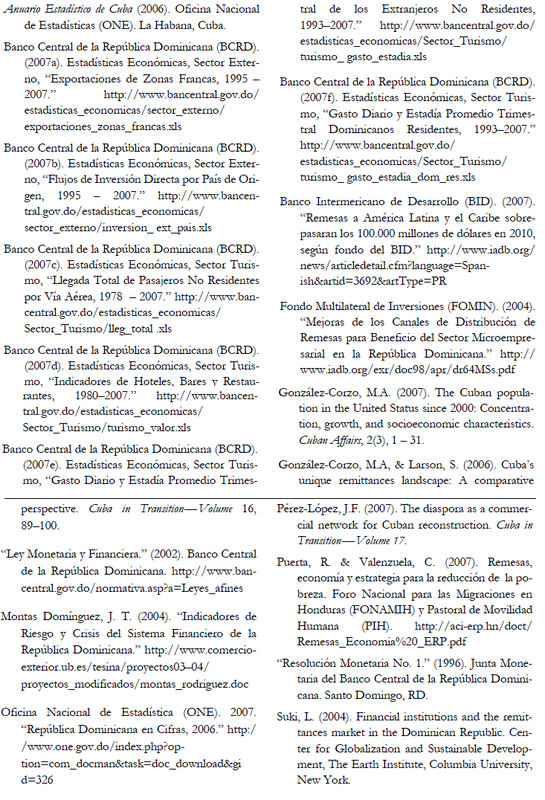 The MFC expanded the products and services offered by depository institutions and other financial intermediaries; allowed the formation of multi-service banks and bank holding companies; and established the capital requirements and lending guidelines for Dominican banking institutions (Montas Domínguez, 2004). The Dominican financial sector was expanded and became increasingly competitive after the ratification of Monetary Resolution No. 1 (Resolución Monetaria No. 1) in 1996, and the approval of a new Monetary and Financial Law (Ley Monetaria y Financiera) in 2002. Monetary Resolution No. 1 (1996) authorized the operation of more than 100 newly-licensed foreign exchange agents and 20 money transfer operations (MTOs) or remittances companies. The Monetary and Financial Law (2002) established the regulatory framework that governs the operations of foreign exchange agents and remittances companies, and the minimum capital requirements for these financial intermediaries (“Ley Monetaria y Financiera,” 2002). The implementation of new projects and initiatives to formalize and modernize the Dominican remittances market has also played an important role in attracting and influencing remittances from abroad. While a detailed description of these efforts is beyond the scope of this paper, the following summary highlights the most recent developments. The Banco Hipotecario Dominicano (BHD) and the Inter- American Development Bank’s (IDB) Fondo Multilateral de Inversiones (FOMIN) launched a Project in 2002 to link remittances with traditional banking products and expand point of sale (POS) capabilities. This project aims to link remittances with the formal banking sector to promote the formation and development of small and medium enterprises (SMEs) (FOMIN, 2004). Banco Popular Dominicano (BPD), the largest bank in the Dominican Republic, with approximately 30% of the market, formed a joint-venture with MoneyGram to link remittances with banking products, equip its automatic teller machines (ATMs) to process money transfers, and link transfers to its payment services. Banco del Progreso, with close to 10% of the Dominican banking market, has a joint-venture with Spanish-operated Banco Bilbao Vizcaya Argentaria (BBVA) and Mexico-based Bancomer Transfer Services to process remittance payments from Spain, Mexico, and the United States. 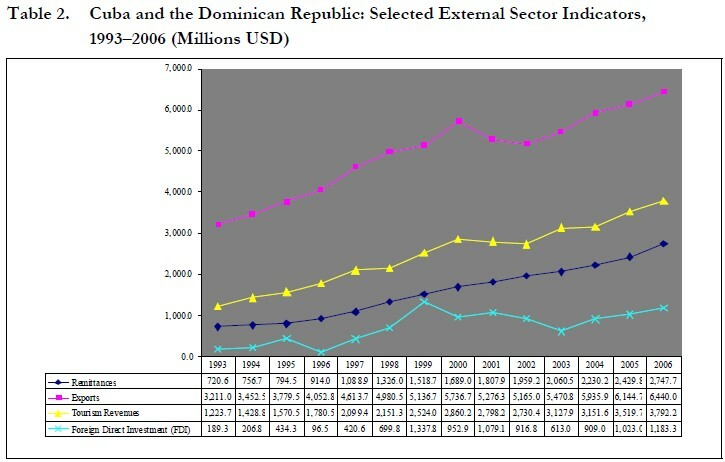 In this section, we use linear regression techniques to analyze the relationship between remittances and several macroeconomic indicators that depend on (or are generally associated with) remittances in the Dominican Republic during the 1993–2006 period. In our model, remittances represent the dependent variable, and the independent variables include gross domestic product (GDP) per capita, imports, inflation, and unemployment. Table 3 summarizes the regression results. As Table 3 shows, there was a statistically significant relationship between remittances and three out the four dependent variables included in our analysis: GDP per capita, imports, and unemployment. 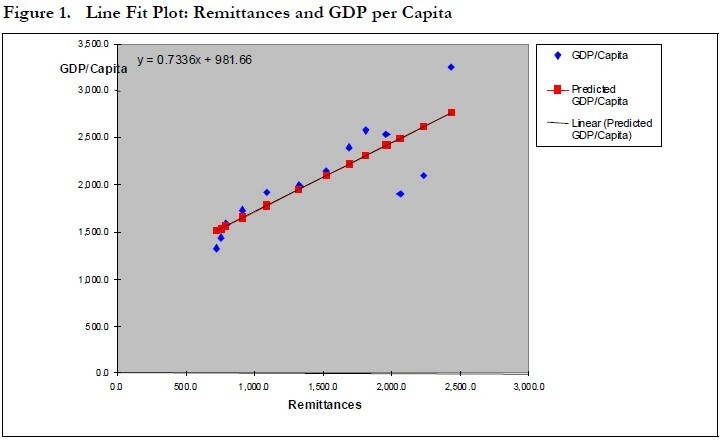 In the case of GDP per capita, we estimated a p-value of 0.0016 and a correlation coefficient (R2) of 0.68, indicating that there is a statically significant relationship between remittances and per capita GDP at the 5% confidence level. 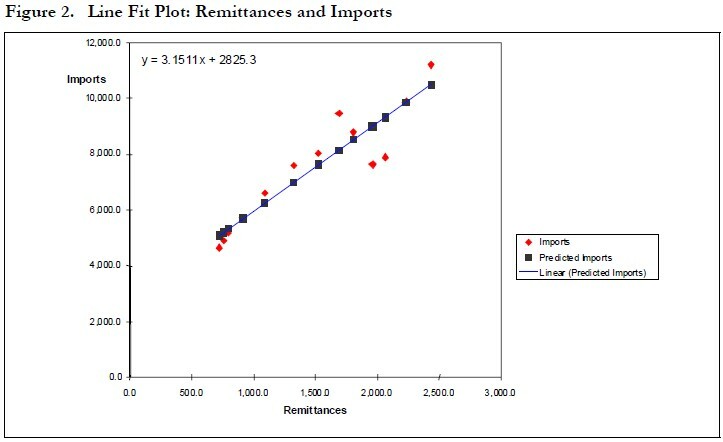 Similarly, in the case of imports, we estimated a p-value of 0.0008, and a coefficient of correlation (R2) of 0.85, which also suggested a strong correlation between remittances and imports. However, in the case of unemployment, the outcome was different. Our analysis revealed that even though there appears to be statistically-significant relationship between remittances and the unemployment rate in the Dominican Republic during the 1993–2006 period, the correlation coefficient (R2) between these two variables was extremely small (0.002) to indicate a positive correlation. Put another way, the results of our regression model led us to conclude that the correlation between remittances, although statistically significant at the 95% confidence level, was very small and, therefore, remittances were not a reliable predictor of unemployment. Figures 1 and 2 illustrate the relationship between remittances and GDP per capita and imports in the Dominican Republic during the 1993–2006 period. As the experiences of the Dominican Republic demonstrate, highly dependent countries, in which remittances play a crucial role, can attract and influence these flows of private capital by implementing certain domestically and externally-oriented policy measures. In the Dominican case, these measures include (1) the liberalization of the external sector, with a particular emphasis on export-led development through the expansion of “free trade zones” (FTZ); (2) attracting foreign direct investment—mainly in tourism and other export-oriented sectors of the economy; (3) promoting macroeconomic and exchange rate stability; (4) modernizing the banking and financial sectors; (5) adopting new technologies and innovations to improve efficiency and transparency in the remittances market; (6) liking remittances to the formal banking sector; and (7) the development of small and medium enterprises (SMEs). The experiences of the Dominican Republic suggest that the implementation of similar policies, in conjunction with other measures designed to adapt to the country’s unique conditions, may have a positive impact on Cuban remittances in the long-run. Some important (additional) measures that could be implemented in Cuba in the future include reaching out to the Diaspora to promote heritage, or nostalgic tourism, stimulating investments in SMEs, and providing opportunities to capitalize on the vast entrepreneurial experience, and human and social capital of the Cuban community abroad (Perez-Lopez, 2007). The Cuban remittances market could also benefit from the elimination of existing remittance and travel restrictions in the United States, the implementation of policies to reduce transaction and confirmation costs on both sides of the Florida Straits, and institutional efforts to link remittances to the formal banking sector and to the development of SMEs and other forms of private sector investment. Finally, as the experience of the Dominican Republic suggests, Cuban remittances senders and receivers could also benefits from initiatives, such as joint ventures and public-private partnerships that would integrate new technologies such as smart cards, point of sale technologies, and web-based remittances platforms to improve competition and efficiency in the remittances market.